Health of the mother. Health of the unborn child. Legal safety of the mother. Legal status of the unborn child. But recent polling of New Zealanders found there was strong support for legal safeguards and for greater time limits on the provision of abortion, including from those who generally support abortion. The vast majority of the population accept the current legal framework. They actually want a greater presence of safeguards around issues such as coercion, standards for providers, and informed consent. These results confirm that the Labour-led Government has no mandate at all to liberalise the abortions laws. 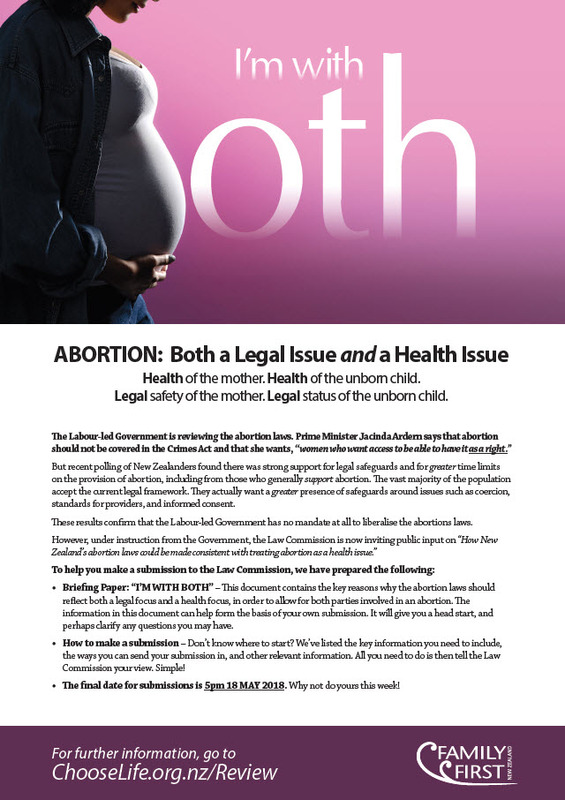 ◾Briefing Paper: “I’M WITH BOTH” – This document contains the key reasons why the abortion laws should reflect both a legal focus and a health focus, in order to allow for both parties involved in an abortion. The information in this document can help form the basis of your own submission. It will give you a head start, and perhaps clarify any questions you may have. ◾How to make a submission – Don’t know where to start? We’ve listed the key information you need to include, the ways you can send your submission in, and other relevant information. All you need to do is then tell the Law Commission your view. Simple! ◾The final date for submissions is 5pm 18 MAY 2018. Why not do yours this week!